After tea we presided to the field of play, Tim opted for The Kumar's Niraj and Varun respectively. Whitstable had a tough 210 winning total to achieve and we asked we're they prepared to chase or dig deep in the trenches to hold out. A very tidy opening 4 overs saw Varun strike first with his 12th ball, plum LBW "Howzat" we all screamed and a reluctant finger gave Butler his marching orders. Niraj not being outdone responded with a wicket maiden 16 for 2 then again later. Whitstable were on the ropes and for a while I thought I was going to be home for Countryfile- however, the opposition Captain had other ideas and held out while Vishnu & Umar put in good shifts. To be fair both gentlemen being very unlucky not to take a wicket in their shared 9 over stint with consistent pace, line and length. Something had to give, Tim needed to change things to find that wicket. Up popped Jas the Ace with his 3rd over of mixing it up and finally broke the stubborn batsmen with a cheeky slow ball nudging the stumps 116 for 4. The talented duo Sam R and Pete T tried their luck in between, but if we were going to win we needed wickets. It was time to bring on our opening pair. As quick as a flash with 7 overs on the distant scoreboard Team ODCC were soon huddled together with Varun and Niraj taking important timely wickets. 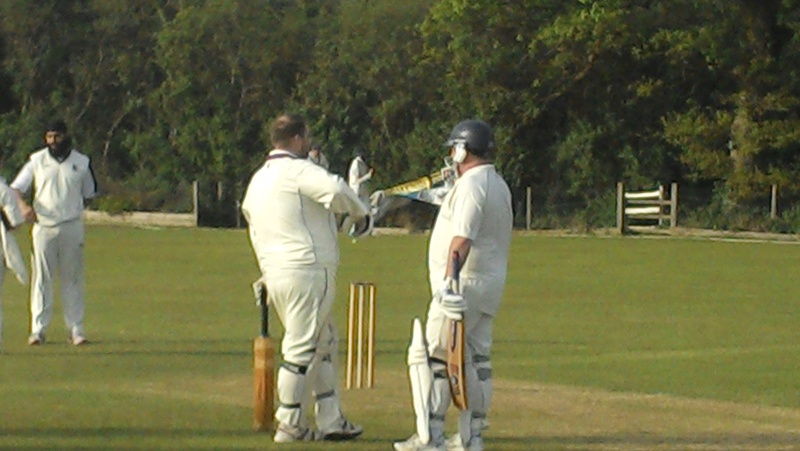 We were on a high and the win seemed possible, Whitstable on home wicket held on for dear life. A formidable set field consisting of 3slips, gully, silly mid on/off, short fine leg not to mention a wee bit of sledging ( PA & Ace being ticked off by their umpire) we still couldn't get the Communists out! The Result: A Winning Draw A great fixture and a great team effort. A special mention to the fans for their away support, Thank you. Finally, Niraj Kumar 11o 3m 11r 4w & Tim's 88.